its » Guardian Survival Kit for Children Print this page Email this page Guardian Survival Kit for Children Guardian Survival Kit for Children SKU#: SKCK Signup or Login above to view pricing and place orders Product Description This survival kit was designed to meet the needs of a child 11 years and younger. This quality kit is packaged securely in our Multi-pocket Hikers Backpack. The kit includes the following: Food and Water: The food and water in this kit will comfortably provide you with adequate nutrition for 72-hours without access to additional supplies. These products have a 5 year shelf life. 12- 4oz. Water Pouches 6 - 400 Calorie Food Bars (2400 Calories) 10 Water Purification Tablets - each tablet purifies 1 liter of water Light and Communications: In the event of a power outage caused by disaster you’ll have independent access to your own means of lighting and communication with the outside world. AM/FM Radio with Batteries and Headphones Rechargeable Squeeze Flashlight - 3 LED flashlight 3 - 12 Hour Emergency Bright Stick 5-in-1 Survival Whistle Shelter and Warmth: These supplies will provide protection from outside weather forces. They will protect you from wind, sun, rain, and many other conditions you may encounter. Warm Fleece Blanket 16 Hour Body Warmer Emergency Poncho for Children Tools: These items are designed to be useful in disaster situations. They will be a valuable resource when you find yourself faced with navigation, transport, personal protection, or shelter troubles. Warm Winter Gloves N95 Respirator Dust Mask - NIOSH approved All of our kit items are packed securely in a resealable, waterproof storage bag Hygiene and Sanitation: When in a disaster situation it is useful to have access to hygiene products. Staying clean can protect against infection, disease, and depression. Hygiene Kit Tooth Brush Tooth Paste 9 Wet Naps Soap 3 Pocket Tissue Packs First Aid: These first aid items can assist with minor injuries and protect against serious health concerns in disaster circumstances. 37 Piece Portable First Aid Kit Other: These items are useful for stress relief and activity in strenuous or challenging circumstances. Activity Coloring Book with Crayons Children’s Toys Emergency Survival Kit Information: This survival kit was designed using advice from experts in the emergency preparedness industry. It follows guidelines given by government agencies and non-profit preparedness organizations. 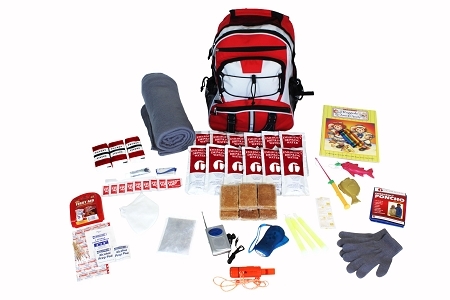 This children’s emergency survival kit has a retail value of $79.